Does anyone want to borrow my stylist/photography assistant? She has strong opinions about how our photos should be set up and insists on making changes at the very last microsecond. The photos wouldn't be nearly as interesting without her involvement, of course. But the sessions would also be much shorter and would involve less setting up and re-setting up, I think. We decided that Sooz's wonderful finger puppets needed a home, so an empty milk carton has undergone massive renovation. 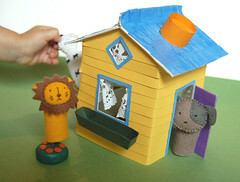 We still need to plant flowers in the windowboxes, and the door needs a window and a doorknob. I also wish the roofer had done a better job and had wrapped the roof tiles around the edges of the roof. But I'm pleased with the siding and with the lace curtains. I've been suffering some nasty sinus headaches this week, so we've been spending more time than usual indoors. Yesterday I happened to turn on the TV while we were eating lunch and found a terrific show called Flea Market Documentary on PBS. Does everyone already know about this program? Check your local listings; I really enjoyed it. And tonight I had the pleasure of meeting the fabulous Nicky Epstein at the Museum of Art and Design, where she did a presentation and fashion show featuring her work. We saw a few previews of her next book and of some patterns in Vogue Knitting. Really lovely work. But I swear I will not start any more knitting projects until I finish my sock, my Hourglass Sweater, and the cardigan I'm planning for The Photography Assistant. However, I do hope to use one of Nicky's edgings on the cardigan, so at least there's that. 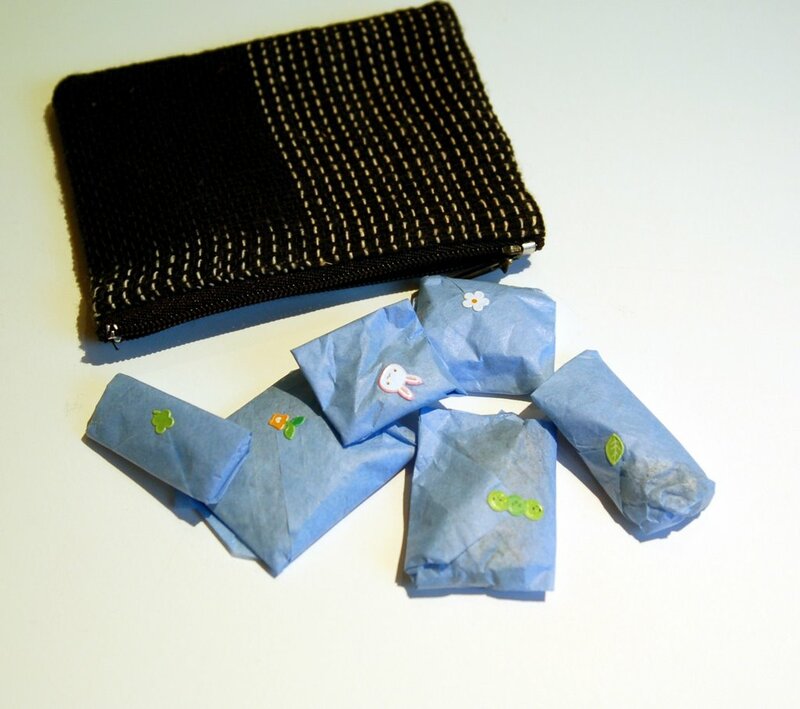 And speaking of Sooz and new projects, look what arrived in the mail a while ago: this little coinpurse with the most adorable little wrapped packages of beads inside. I hated to open them, they were so cute. The beads are all lovely and will certainly become something beautiful someday. Thank you, Suzie! So cute! I will DEFINITELY take that assistant!! I am having lighting issues and I could use her advice! Not to mention her style! I will wait at the front door for her arrival! Thanks! That house is so excellent! I am sure the puppets are thrilled with the new digs :-) All our milk comes in plastic bottles here these days - at least that's my excuse for not making such a fantastic play house for Amy. very cute! you reminded me of the cardboard box towns that my sister and i used to make all of the time. i used to sneak and pour out all of the milk to get the cartons. i made a diorama-style one for my daughter; maybe i'll introduce her to the milk carton big leagues. What a cute little house. And very snazzy for a milk carton!